Is it dead? Most of the parking lot in the aerial looks clean, unused, and prestine. I love the homes across the street from the mall. Can you imagine walking out your door and into the mall? I did read on a site, it was expanded in 1956. I looks like it had 2 department stores. I wonder what they were. 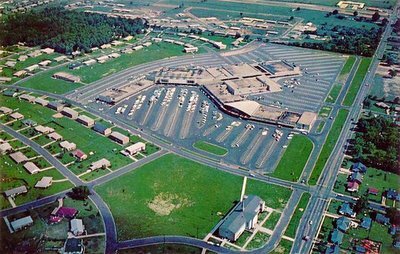 When I was a little girl (from 1 year old to 5 years old), I lived in Montgomery, and my mother and I went to this mall. I don't remember the other department store, but the other one that I know it had was named Loveman's. I grew up in Normandale. The larger anchor stores were: Loveman's Department Store, Parker-Sledge Hardware Store, Winn-Dixie Supermarket, a huge Hancock Fabrics, Name Dropper clothing, Twix-n-Tweens childrens clothes, DeShields Larson's Buster Brown and Fine Shoes, Culp Piano, Normandale Cafe, Woolworth 5 & 10 and Normandale Rexall just to name a few. The grassy patch in the front eventually became Normandale Full-service Gulf Service Station. There I can remember my parents requesting to be filled up with "No Knocks" rather than by price or octane. It was a wonderful place to grow up near, just a bicycle ride away. Unfortunately, the area is now riddled with gang activity and much of the back side of the structure is abandoned and surrounded by a tall chain-linked steel fence (and to prevent entrance to the basement, now in horrible disrepair that was built to be used as a fall-out shelter. 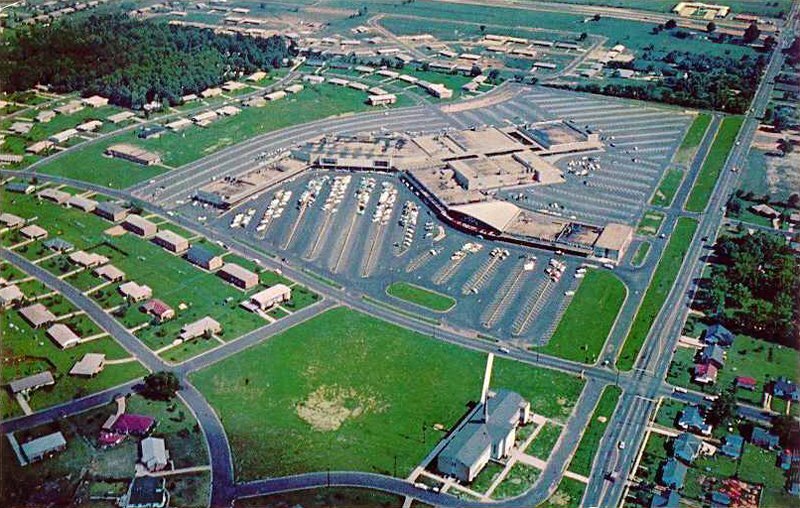 During it's prime (before Montgomery Mall, then Eastdale Mall, then East Chase open mall were built) there was not a parking place to be found. This photo was still early in the neighborhhod age of that section. Most major shopping was still in downtown (Kresses 5 and 10, Montgomery Fair (later Gayfer's, then Parisian). This mall was agamble to get the people away from the crowded downtown area. My parents bought their Druid Hills/Normandale home in 1967, where we resided until 1977. Saturdays were spent shopping, getting our hair done at the beauty parlor (on front - barber shop was on backside breezeway near lounge) and ending it with icecream from the Ice Cream Parlor next to the leather and luggage store to right of the huge base store (Loveman's - which relocated there from downtown as the anchor store). I grew up in Montgomery in the 70's. Here are my recollections of Normandale. Loveman's Department Store. It had floor to ceiling windows on the second floor of the storefront, and at Christmastime, that's where they put Santa. My sister and I got our picture with him up there. There was a Baskin Robbins 31 Ice Cream shop to the left of Lovemans. Spent a lot of time there! I took piano lessons at Culp Piano and Organ. It was located at the far left on the first floor, actually at a basement elevation. The second floor, which was level with the rest of the mall, had doctor's offices. There were actually two grocery stores in the 1970s. The Winn Dixie on the front (had a high rounded roof) and the A&P on the back. The A&P left in the late 70s. I may be wrong, but the Woolworth's became a branch of the Montgomery Public Library, and the A&P building became a drivers license office. In the arcade there used to be a hobby shop where I bought Estes Rockets. I hope these random rememberances help to fill in the picture. When used to go there as a child in the late 1950s - 70's we never called it a mall. It was a shopping center and that is really a more accurate description. There was a covered open air "arcade" in the center that joined all the stores. Loveman's was "the" place to shop during that era. It was quite formal and had a reserved aura to it. My memories of Normandale are still etched on my mind. As a young little boy, I loved this place! Christmas was magical to me there. Does anyone remember the Santa and Reindeer billboard that was erected every Christmas? This billboard contained a robotic sleigh and reindeer display. I also remember seeing the life-size dinosaur displays sponsored by Sinclair gasoline. You could even put a quarter in a machine and it would make a toy dinosaur while you watched! Those memories are with me forever. All circa 1968 or so. In 1995 a tornado hit the NOrmandale area and left the shopping center in disrepair. The arcade was never repaired and resembles a war zone. A reliable source told me that Central Bank, the only original remaining tenant, pays $1/year to remain at the shopping center. It is said that the arcade has barbed wire around it and shops are left exposed to the elements. There used to be a cool portrait of a young boy in a glass enclosed case advertising for Yukmeier's Photography-I wish I had photographed this! I do have many photos of Normandale, including the insult of someone spray painting "pimp" on what used to be the Francis Cafeteria and doctors office section. I love Normandale and would love to share these photos with the appropriate party. I too grew up with Normandale as a HUGE part of my memories. Yes, Christmas was indeed magical there! I remember all the shops, dressing up to go shopping. I also lived much later in the apartments houses across the street from Normandale, they are all lined up in a row. It was my first apartment as a young adult. When they filmed the movie "A Long Walk Home"there and I enjoyed a great view from my upstairs apartment window. They filled the parking lot with vintage cars from the 50's and 60's. That was a lot of fun watching it restored to it's former glory that I remember as a child! Even just for the time it took to film the movie. Whoopie and Sissy made a great film! Thanks for the memories dear old friend, Normandale! 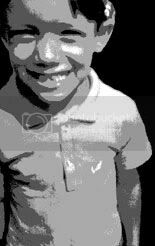 I just found this site after looking for old photos of Normandale. I grew up in Montgomery in the 1960's and this was the place where many of my best Christmas memories took place. The windows were filled with animated Christmas scenes (a real novelty at the time) and I used to look forward to seeing them every year. If anyone has old photos of Normandale from the 1960's or 70's, I would love to see them. Used to love this place. The Baskin-Robbins was a particular treat, as was The Name Dropper. The architecture is pure 60s mod and parts of it are really dark. There's still a great shoe repair shop, washeteria, and grocery store there. The neighborhood is really really sad now - a shell of it's former self and the big push in town out East. I had heard that a someone bought it with hopes that insurance payout would help revitalize it, as well as plans for the surrounding area, but all that fell through or so I was told. Some of my fondest memories are there as well. Right now all I can think about is one Christmas Eve when I lived directly across the street in the 4-plex apartment houses, this man that I was so in love with came and picked me up and we spent the evening riding in his car listening to music. I felt so warm so safe and like this was who God had intended me to be with. Normandale mall holds both of our fondest childhood memories. Santa in the huge window on the second floor of Lovemans Department store. It was magical for me as a child and that one special Christmas Eve, the most special in my whole adult life that I have never stopped thinking about. I grew up in and around Montgomery in the sixties and, as a child, thought Normandale was the "neatest" place in the world. No one has mentioned Liger's Bakery, in the area between Loveman's and the doctors' offices (excellent lemon cheesecake) or The Record Shop (where I spent ungodly amounts of money), near the end of the arcade. A landmark of Normandale was the huge arched windows over the Winn-Dixie entrance, behind them were gigantic black and white photos of farmland around Montgomery. I also remember the large talking Christmas tree in the front parking lot each December. The Hancock Fabric store had been a Woolworths for many years previously. Some time in the late seventies The Record Shop moved to its own building on the eastern bypass and became an appliance store (its inventory had been increasingly moving in that direction for years). The only photos I have were taken around 1965, when the Sinclair Dinoland dinosaurs were on exhibit in the front parking lot. JG Fuller, I would be VERY interested in your Sinclair photos as this is a fond memory of mine. Remember how you could even get your own injection molded model? Be lenient when judging these photos, they were taken by an eleven year old boy with a Sears Instamatic camera. You have NO IDEA what memories you brought back for me! THANK YOU! THANK YOU! CAME ACROSS YOU PAGE WHILE I WAS LOOKING FOR INFO ON THE NOW RUN DOWN EASTDALE MALL. I REMEBER MY A FAMILEY FRIEND LIVED IN THAT AREA IN THE 80s,IT WAS STILL A SAFE AREA BACK THEN. I DO BELIVE THE MAIN BUILDING OF THAT SHOPPING CENTER IS NOW THE FLEA MARKET MONTGOMERY, "ITS JUST LIKE A MINI MALL" SO SAYS THE CRAZY OWNER WHO AS ON THE ELLEN SHOW FOR HIS COMMERICALS. Today is a hppy/sad day for me as I parked my truck in front of the abandonded Loveman's Department Store. I looked into the empty buildings first floor and saw the esclators. Did you know Loveman's had the only esclators in Central Alabama in 1954? As I looked up, the ceiling was crumbling. The lights that illuminated the huge second floor picture windows were hanging by old electrical flex cable. I never new such would come to a wonderful place,a place where I could park my Stingray bycycle in the Bike Rack and not have to worry about it being stolen. Off to Toyland I would go! I remember oh so much,like Zippy the Ice Skating Chimp. I had wonderous times at Normadale. It is true everything changes in the quest for progress. I just want the hamburger steak childs plate from Francis Cafeteria and to be with my family again. But,who dos'nt? I lived in the Normandale area from 1963 to 1973. I actually lived on Bridlewood Dr which is two blocks away. I loved riding my bike to the shopping center especially on Sunday's when you could ride all over without running into anyone because the stores where not open then. I remember going to the drug store to the right of Winn Dixie to buy candy and read comic books. I attended Normandale Baptist Church and went to Floyd Elem School. I loved going to see Santa at Loveman's and he giving me the biggest candy cane. Does anyone remember the fountain across from Woolsworths. The shopping center was having some type of event and I remember this girl preforming some type of acrobatics in the fountain with the water was spraying. I too remember the dinosoours that were in the parking lot. They were so cool. I loved that time of my life and the area that I lived in. It was a wonderful time. I now work at the fire station that is right down the road from Normandale. I went to Harrison Elem., then to Floyd Jr. High. I too remember the good times. I would like for anyone with pitchures to e-mail them to me so that we can blow them up and put in our fire station so that the young men there can get a feel of what was and have a sense of pride in their station today. FYI: There is a wonderful Facebook page called "You Grew Up in Montgomery if . . . " and the folks there LOVE old pics of Montgomery. I've seen several discussions and photos of Normandale, but if anyone has more, please post! Anyone can join that FB page (but no spam). My Grandfather was the maintenance man there for 30 years. I spen many days of my youth exploring Normandale. It has an unbelievable basement with access to all the stores. Add to other stores mentioned two boys/men's stores: Dadn'Lad, and later on, Coventry. For many years this Center represented the best of Montgomery's space-age, modern, prosperous economy. I remember Loveman's fondly both downtown (toys in the basement!) and at Normandale (Santa in the big show window upstairs. The smells and the sights inside were exciting in a way only a child can experience! In my dreams, it would be restored to gleaming glory and flocked to by shoppers and youngsters longing for a glimpse of America's golden era when growing families were energized by the newness of TV, American cars, and drive-ins! I wonder if anyone can answer a question I have about the mall. I attended a formal dance in the basement there in 1959 and neither my mother or I can remember what the occasion was. Does anyone know who might have been holding dances there?